in Disneyland. The film has been re-shot using the 9-camera CircleVision format (as opposed to the old 11-camera Circarama format). The Disneyland Railroad's newest locomotive No. 5 Ward Kimball officially goes into service. 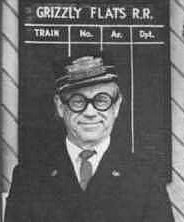 It is named for the late Ward Kimball, Disney animator, musician, and railroad fan. episode 22 - "Versa Day." he developed a restaurant for the French pavilion in EPCOT's World Showcase. Disney's Oswald the Lucky Rabbit short The Fox Chase is released. Disney's animated feature Dumbo is released in Denmark. Elliott Gould & Ricky Schroder, are both released in the U.S.
until the release of Herbie: Fully Loaded in 2005.
animals to an island for a new religious mission. Mo Vaughn, the popular Anaheim Angels first baseman, along with boys and girls from the "Gene Autry RBI League," participate in a mini cavalcade and ceremony with the Dapper Dans on Main Street in Disneyland. The Dapper Dans lead the audience in "Take Me Out To The Ball Game." Second Annual Star Wars Fan Day at Disneyland. Disney Channel Asia airs High School Musical for the first time. Disney's Mickey Mouse film The Fire Fighters, directed by Burt Gillett, is released to theaters. Chief Mickey and Horace Horsecollar respond to save Miss Minnie from a blazing emergency! evacuated from the elevated tracks by ladders and cherry-picker cranes. Disney Channel debuts "Tanner," the 5th episode of the series Phil of the Future. It is directed by Joana Kerns (who portrayed Maggie on the hit series Growing Pains between 1985-1992). will now be distributing Disney shorts. The celebration starts at 8PM at the Disney Studio on Hyperion Ave.
finest animators ever to work for Disney, Kahl will go on to become one of Walt's Nine Old Men. the still-anonymous buyer has completed nearly all of the land purchases for a mystery project. Disney Archives. The occasion also marks Smith's fortieth (and final) year at Disney. the Westin Bonaventure in Downtown, Los Angeles. The Disney-owned ABC picks up a total of 10 awards. 16 Wishes, a Canadian-American television teen film starring Debby Ryan and Jean-Luc Bilodeau, premieres on Disney Channel. Ryan plays Abby Jensen, a teen who can't wait to grow up. and trucks taking part in the transcontinental road rally. Disney auction at Van Eaton Galleries. The biographical film What's Love Got to Do with It, based on the life of soul singer Tina Turner, is released by Touchstone Pictures. The cast includes Angela Bassett as Turner and Laurence Fishburne as her husband musician Ike Turner. The screenplay is adapted by Kate Lanier from the 1986 book I, Tina written by Tina Turner and Kurt Loder.